Project Highrise has a release date! You’ll be able to start building skyward on September 8, 2016. The game will launch on PC and Mac for $19.99/£14.99/€19.99. But hold on to your hard-hats, because to mark this exciting announcement, you can now pre-order Project Highrise on Steam and save 10% off the release price. Aurora, a statue inspired by the dawn of modernism. A bold standing light to adorn and illuminate. Catalonia chair. A stylish standby of skyscraper lobbies. A cubist fountain with water gently cascading over carved granite. An elegant teak table, a curvaceous, contemporary design. Brünn chair. A sleek statement of modern interior design. Carrara marble walls – the height of sophistication. Also, in case you missed it, here’s our latest game play trailer made by our friends at Kasedo Games. Check out our YouTube channel for lots more videos including quite a few Let’s Plays. We are also working on Steam Workshop to support mods for Project Highrise. We’ll have more info about them as we get closer to release. In the past, we’ve talked a lot about the game design and the systems in the game. In the process, we’ve also shown a huge variety of game art. So this week, we’d like to go back in time and look at the things that inspired the visual design of Project Highrise. First, a bit of an abstract aside. We had an idea that we wanted the game to look like a past view of the future. Those imaginings are fascinating to behold – mainly to see how wildly wrong they were. Hence our offices with the hulking CRT monitors and some apartments with some very classic looking appliances and furniture. But there is an undeniable optimism to many of those images – especially those from the 1960s. That ideal – that we can perfect the future through design – was pervasive in the early 60s. And we took many of our visual cues from that era. That’s a color palette from a 1960s home design catalog – specifically from Eichler homes in California. Look at some of the names: Pumpkin. Sunflower. Eucalyptus. The idea that the home or building should strive to part of its environment rather than obliterate and dominate was a new one in the 1960s. These colors reflect that outlook. We drew a lot of inspiration for wall colors and base colors from these palettes. Ok, that last one isn’t from the series, but it’s inspired by it in the way that we were. In Project Highrise, players have to be able to identify people by type quickly. So we wanted stylized characters that still provided some opportunity for variation in clothing colors. Those were some general influences from the 1960s (and from the 2010s view of the 1960s) when it comes to color and character art. Now let’s look at two monumental figures from the 1960s that we drew heavily upon for the visuals of Project Highrise – Ludwig Mies van der Rohe and Dieter Rams. We’ll start with Mies. We live in Chicago as did Mies from 1937 until his death in 1969 and the city is chock full of his work. The outer skin of the building in Project Highrise is essentially a mash-up of Federal Center, the IBM Building and 860-880 Lake Shore Drive. Those are below in that order. 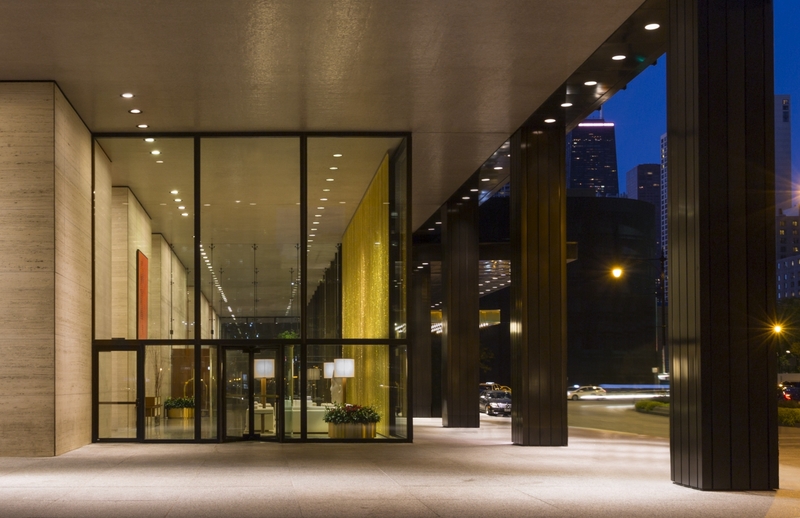 The Mies style of architecture was unprecedentedly bold: strong rectilinear grid, supporting beams and infrastructure on the outside instead of being hidden away, showing the materials from which the building was made right on the facade. It spoke of the technical optimism of the era, and the style became the dominant influence worldwide. The grid. The colors. The type. Doesn’t get more 60s modern than that, does it? So it’s with that that we’ll end our review of the visual inspirations behind Project Highrise. As a final aside, we’ve heard a few people say it looks like the 1990s. I think that’s our “alternate future” bulky CRT monitors and dot-matrix printers. And also your humble narrator (and art director) is a child of the 90s having gone to high school and college in that decade. Much of it was spent (re-)discovering the music and fashion of our parents. Who mostly grew up (you guessed it) in the 60s. This week is all about a residential tower. We’re working on tuning the scenario mode of the game and this is the result of a partial play through of one of the apartment building scenarios. Clicking on any of these images will open a giant version in a new tab. Enjoy! First let’s start with a zoomed out view of the entire tower at night. If you click on the larger version, you’ll notice one of the main things that differentiates an apartment building from an office building – there are people in it at night! Let’s get a bit closer on some of them in the early evening. This is mid-evening in some of the building’s studio and one-bedroom units. We’ve got residents making dinner, relaxing and of course spying on the neighbors across the street. Let’s go forward in time a bit and upward in the tower. Here it’s the middle of the night. Most people are already in bed and the few night owls that stayed up too late are also turning in. And now it’s a beautiful morning. Residents are heading out for another day at the office while those that work in the building are arriving. One of our main goals in Project Highrise has always been to make buildings feel alive, filled with people whose daily comings and goings create an irresistible bustle. In addition to the aesthetic feel of that, the people’s daily activity drives the economy of the building. Our “living building” objective requires a large number of people. We gave ourselves a performance goal: the game needed to be able to run with 1000 NPCs at 60 FPS on a reasonably recent desktop-grade personal computer. 1,000 NPCs at 60 FPS. Click to make the madness larger. This posed an interesting implementation challenge. We’re a tiny team with only one programmer whose job is not just AI, but also to build the entire rest of the game as well. So we needed a system that was very fast to build, required very little ongoing maintenance once it was built – and primarily, helped us reach our goal. We wanted to have our people live very stereotyped, routinized lives – following a predictable daily routine that will give rise to that feeling of a bustling highrise building. We also wanted to have a lot of designer control over those daily routines, to enhance the fiction of the game – so that worker and resident behavior would match their socio-economic status, but at the same time, have a lot of variety and quirks for “flavor”. This is called an “action selection” problem, which is something that game character AI has to do all the time: figure out “what should I be doing at the given point in time?” In Project Highrise, we built this in layers. First we build individual actions (like “go somewhere” or “sit down”), which are simple and atomic. We then assemble those actions into stereotyped scripts, which are descriptions of simple daily activities such as “going to the office”, “going to a sit-down restaurant and sitting down to eat”, “processing a repair request from a tenant”, and so on. Finally, those scripts are then be bundled together into various daily schedules, with simple logic for picking the right script based on current conditions such as time of day, and equally simple “working memory” (which remembered, for example, where the character wants to go, where their current job is, where their current home is, and so on). In terms of computational cost, this selection process is trivially inexpensive. From 8 am until 4:30 PM. they go do work at their office. Then at 4:30, they go “offsite” (by that we mean “home”). While at the office, there could be several things that could impact their routine. For example, if the office is run down, the worker will react negatively. If there are too many stairs they have to climb to get there, that will make them upset. And there are many more things that might impact the happiness or unhappiness of the worker. That means that at noon, there’s a 50% chance that the officer worker might want to go get lunch. So is there a place to get lunch? If there is, great! The worker will head there and buy lunch, and the restaurant will benefit from being patronized by a customer. If there’s no place to have lunch or the lines are too long, then the worker will get unhappy. We can control all of that behavior by simply adding the one-time event of “go-get-lunch” into the daily schedule. This is a much busier day than our office drone. There are probabilities that they’ll want to at various times of day get a coffee, get breakfast, get lunch, go shopping and get dinner. Plus maybe a few errands here and there. These schedules represent the ideal routine for each resident or worker. Players must try to accommodate these routines. If they succeed, the people will be happy. It’s when the routines break down that unhappiness begins to seep in. Unhappy apartment residents may soon seek a new home. Unhappy office workers may contribute to an office moving out. With the action selection question answered, we moved on to pathfinding. Once our (potentially) hundreds of people had decided what to do, how would they go there without causing a huge hit to performance? The game takes place on what is essentially a 2D grid – a cut-away side view of a building, which can be, say, ~100 stories tall and several hundred tiles wide , depending on the scenario. A naive implementation of A* pathfinding on the raw grid representation quickly turned out to be insufficient, with hundreds of NPCs trying to navigate the grid at the same time. So we reformulated pathfinding so that, instead of using a simple grid, we built a specialized compact graph representation, which had support for the user changing the path graph all the time (as they built, altered or expanded their highrise). Based on the game’s design, the pathable space divided up into distinct floor plates, which were contiguous sequences of tiles on the same floor, such that the character could do a straight-line movement inside a floor plate. Additionally, each floor plate was connected with those above or below it via stairs, escalators, or elevators, together known as connectors. Floor plates and connectors became nodes and edges in our high-level graph, respectively, and movement inside each floor plate became trivial. A path! A path! Click for larger. This search space reduction was significant: for an example of a dense building 100 stories tall by 150 tiles wide with four elevator shafts, we reduced the space from 15,000 graph nodes to only 100, with 400 edges between them. This made pathfinding performance fast enough that we could still just run A*, but on a much more compact data model. Finally we wanted to take care of the worst case scenario, which is when a lot of people accidentally all want to perform pathfinding at the same time (imagine a movie theatre, when the movie ends and everybody wants to go home). If this happens on a single frame, even an efficient pathfinding system would have a lot of work to do – and in order to maintain 60 FPS, we must limit each frame to take ~16ms in order to prevent framerate hiccups. So we resolve that by implementing a simple job queue system with a limiter, such that in the case of that worst-case scenario, we spread the queue of pathfinding requests over multiple frames, instead of doing them all at once. And there’s a very fast overview of our fast AI! Next time we’ll talk about the design side of things, and the kinds of design variety that we can get out of this system. It’s a day in the life of a Project Highrise skyscrape in animated gifs! Click on any of them to open larger versions in a separate tab or window. Over the course of a day, you’ll see a lot of varied activity as residents, workers and visitors go about their lives. Let’s start in the morning. Here we’ve got a few latecomers getting to work as well as some visitors arriving for some very important business appointments. Some say that breakfast is the most important meal of the day. But if you’re the developer of an office building in Project Highrise, that honor is definitely reserved for lunch. Make sure that there are enough restaurants to meet the demand at the lunch rush! We leave you this week with the serenity of late night. After the workers have gone home and the janitors have done their work, the only sound audible over the din of the city is the soft splashing of the fountains. Soon another day begins anew in the tower. Next week we’ll get technical about how we got all of those people moving about in the tower. It’s time for some show and tell in this week’s post! Click on any image in this post to view a larger version of it. This post starts off with a quote that has fewer letters than the name of the man who said it. Project Highrise visual design was highly influenced by Mies’s architecture and design philosophy. We’re based in Chicago where he spent the more prolific part of his career and there are many examples of his work in our fair city. Recently, we’ve been working on several visual refinements to the game. First of all, we’ve implemented a new outer skin to the building. When designing the visuals for the exterior of a building in Project Highrise, we took Mies’s maxim quoted above to heart. A key tenet of the architectural style championed by Mies is that the building’s structural elements should be sufficient in terms of decoration. We tried to follow that when creating the outer skin of our building. So the windows are simply framed by structural columns and the roof decoration is limited to the ventilation shafts. Moving downward to the subterranean portion of a building…. There are also new support pylons that act as the foundation of your skyscraper. If you’re building an 80 story tall building, it’s important to make sure it’s well-anchored in bedrock. So we also included bedrock which you can see in the bottom of this image. In an earlier Architect’s Notes, we talked about utilities and the pipe and wire infrastructure of a building in Project Highrise. In this rainy day image, you can see the conduit that brings electricity, telephone, cable TV, water and gas service into your building from the city’s utility grid. Also, if you’ve ever seen one of Mies’s skyscrapers in person, one of their more striking features is their soaring glass-encased lobbies. One of the finest examples is the IBM Building here in Chicago. So of course we had to have glass lobbies to Project Highrise. And finally, we’ve added clouds and did some refining of the day and night cycle. So we’ll leave you with an animated gif of a day swiftly rushing by. Click here or on the image to view a higher quality movie clip. Project Highrise is now in preview on Steam. You can’t buy it (yet), but you can add it to your wishlist and follow it for more updates as we move toward our launch later this summer. If you clicked through to the Steam page, you might have also noticed that our friends at Kasedo Games have made a teaser trailer video for Project Highrise. (Whoever’s is the soil, it is theirs all the way to heaven and to hell). A question we get frequently when people first see Project Highrise is an obvious one when your game is based on building skyscrapers: “How high can I build?” On the technical side of the game, that’s mostly up to you as the player – how tall can you or do you want to build? But it’s also more complicated than that, because city laws and rules also impact you as tower builder and manager. That opening quote in Latin forms one of the core tenets of modern property law – that if you own a piece of land, you own everything that’s above it and below it. However, that doesn’t mean that you’re completely free to do with it as you please. Cities set rules, limits, regulations and statutes that govern construction of everything from backyard sheds to gleaming towers of steel and glass. The city regulates how much tower you can build. Click the image for larger. Almost as soon as steel frames liberated builders from the rather modest height achievable with masonry load bearing walls (see the Monadnock Building building in Chicago for the limits of masonry walls), cities began imposing limits on how tall these new buildings could rise. In 1920, that was 264 feet in Chicago and between 600 and 700 feet in New York. In addition to the limit on height, there is also the concept of air rights. These are a set of rules and calculations that permit a given number of square feet to be built on a lot based on its dimensions and location. The combination of these two things largely defines how much tower you can build. As an aspiring developer in Project Highrise, you’ll have to be keenly aware of those limits as you plan and construct your tower. You will only be able to build a set amount of floor space, and up to a certain height. So do you go as tall as possible and maximize for height? Or do you max out your floor area first and building height second? Maybe you build a large base and a skinny tower (or two)? This large building is nearing its city-imposed limit on height. Click the image for larger. In Project Highrise’s campaign mode scenarios (and to a more limited extent in sandbox), you’ll be confronted with building lots of many different configurations and sizes. Some come with their own special city limitations for you to work with (or around). Your challenge will be to create a prestigious, prosperous tower within the constraints of size, zoning and other civic constraints. Of course, there are ways to massage those rules in your favor. You can hire consultants that can use their influence with City Hall to allow you a valuable exemption. You can agree to build some public space in exchange for an increased allocation of air rights. Often the city will also be looking to encourage specific types of construction – tall residential towers or expansive office buildings. You should use these initiatives to your advantage. A successful developer will have to manage more than just the tenants in the building, but a whole host of external pressures. More on those other external pressures next time. In previous notes, we’ve met workers who will help you build and run your tower – such as construction workers and service workers. Today we’d like to introduce you to your management team – the consultants who will assist you with various aspects of building management and improvement. Good building management is key to becoming a highly prestigious, sought-after address. To project an aura of sophistication and modernity, and to improve the aesthetics of your building, you will want to hire an interior designer who has the right connections with all the right galleries. Good relations with City Hall will also prove invaluable, and you should hire a lobbyist who has the ear of City Hall to arrange for certain lucrative concessions or exceptions from pesky city regulations. Finally, you should optimize your building through experienced building management. From hiring more construction workers to increasing service capacity, a good building manager can make things in your building happen more efficiently and with greater speed. Building managers managing a building. These consultants are essentially management mercenaries. But while they’ll work for cash, they won’t work for just anyone. In Project Highrise, you need to prove that you have enough cachet to attract them and their services. In other words, you need to have influence. So, how do you get it? Influence comes from having important tenants in your building, such as big corporations or rich residents, and keeping them happy. The more important tenants you have, the more influence you will have, which in turn will make your building an attractive place for consultants to ply their trade. Once you have the right management team in place, you can then begin to parlay your accumulated influence into various building improvements, amazing artworks, or valuable exemptions to city regulations. After the interior decorator has decided to join your team, you’ll be able to get those sought-after pieces to adorn your lobbies and hallways. This will greatly increase the prestige of your building. Or how about a metro station in the basement of the building? That would certainly increase the value of your building for current and prospective tenants. Your lobbyist can work on leveraging your influence with City Hall to make that happen. Extra construction workers would also make everything go faster – from building expansion to moving in tenants. Your building manager consultant can arrange for that. World-famous towers need world-class management. Influence and a good team of consultants will be crucial if you want to create a famous address. The desire to reach for the sky runs very deep in our human psyche. This month, we’re taking a quick break from our usual posts to announce some exciting news about Project Highrise. We’re proud to announce that we’re teaming up with Kasedo Games, a division of Kalypso Media, to release Project Highrise. If you’re not familiar, Kalypso is the company that brought us the lovely and wonderful Tropico series of games. While this doesn’t mean that El Presidente will have an office in your tower, it does mean that we’ll have a lot of help from them as we work toward releasing Project Highrise this summer. You can learn more more about Kasedo and the other games they’ve released or are in the pipeline by visiting their website at www.kasedogames.com. They’re on twitter at @KasedoGames. You can also see the press release about our partnership here. We’re going to be at GDC in San Francisco next month to demo the game. If you’re in the media business and would like to spend some time with us and see the game in vivo, contact Lindsay Schneider at Kalypso for an appointment. And to all of our Bay Area friends, we’ll see you in a few weeks! Project Highrise has got a logo! Eddie Einikis, the artist that created all of the offices and other tenants in the game also created this amazing logo for the game. Pretty neat, right? We’ll return to posts about the ongoing development of the game next month when we’ll delve into the beginnings of the game’s campaign mode.